We’d love your help. Let us know what’s wrong with this preview of Some Writer! by Melissa Sweet. To ask other readers questions about Some Writer!, please sign up. Be the first to ask a question about Some Writer! This book is magical. I could feel it the moment I held it in my hands. It's so alive, it seems as though it has a pulse of its own. I can not recommend it enough. Do not be fooled, thinking it is a "children's book." My children are precious, but this is not for them. It is for me, and for all lovers of E.B. White, all writers, and all biography aficionados. I have loved E.B. White since my childhood, and I consider Charlotte's Web one of the most perfect books ever written. I have more recently This book is magical. I could feel it the moment I held it in my hands. It's so alive, it seems as though it has a pulse of its own. I have loved E.B. White since my childhood, and I consider Charlotte's Web one of the most perfect books ever written. I have more recently discovered his "adult essays," and I cry or laugh through most of them. I now love Melissa Sweet as well, for this inspired and wonderful book. I had moments while I was reading this that my hands shook, and moments where spontaneous tears ran down my face. I would love to fill this review with quote after quote from the book, but it would be more useful for me to say. . . go get it. You won't regret it. All that I hope to say in books, all that I ever hope to say, is that I love the world. I guess you can find that in there, if you dig around. Dig? No. You don't need to dig in his work to find the love. It's all over the place. A 176 page picture book biography? Yes, please! Some Writer! is one of the best biographies, for kids, that I have ever read. This books has to be in the conversation for all the major awards: Sibert, Newbery, Caldecott. "Anyone who writes down to children is simply wasting his time. You have to write up, not down. Children are demanding. They are the most attentive, curious, eager, observant, sensitive, quick and generally congenial readers on earth...Children are game for anything. I throw them hard words, and they backhand them over the net." To start: E. B. White is one of my most favorite authors. Ever. His books are crackling with heart and charm and are true to the spirit of childhood. And anyone who can "Anyone who writes down to children is simply wasting his time. You have to write up, not down. Children are demanding. They are the most attentive, curious, eager, observant, sensitive, quick and generally congenial readers on earth...Children are game for anything. I throw them hard words, and they backhand them over the net." To start: E. B. White is one of my most favorite authors. Ever. His books are crackling with heart and charm and are true to the spirit of childhood. And anyone who can write mere letters that I will willingly sit and read for hours has some serious magical talent. 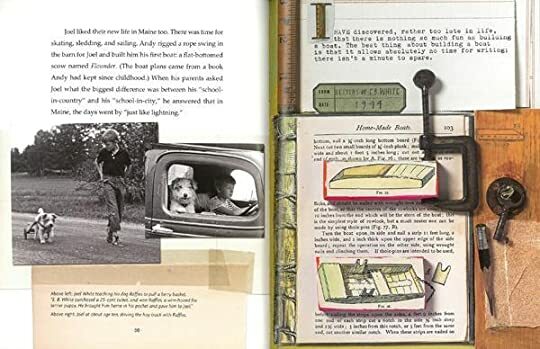 I’ve also been in awe of Melissa Sweet’s work since I first read Balloons Over Broadway--I love how she dives into the depths of her subject and brings their essence into both her writing and her completely unique collage art. When I’m dead and famous, please write my biography exactly like this one. It felt like reading a scrapbook with all the photographs, newspaper clippings, and letters scattered throughout. The scrapbooked decorations were adorable, and the illustration style was very fun. <3 Quite the aesthetically pleasing book! My favorite part was when it showed the six different drafts of the first line for Charlotte’s Web. I quite identified with his author-ly struggle. ;) E.B. White led an enthusiastic, When I’m dead and famous, please write my biography exactly like this one. It felt like reading a scrapbook with all the photographs, newspaper clippings, and letters scattered throughout. The scrapbooked decorations were adorable, and the illustration style was very fun. <3 Quite the aesthetically pleasing book! My favorite part was when it showed the six different drafts of the first line for Charlotte’s Web. I quite identified with his author-ly struggle. ;) E.B. White led an enthusiastic, jam-packed life. His was a lesson in gleaning experience, joy, and wonder from every circumstance. His sense of humor was up my alley, and I love his frank yet whimsical writing style. Since this book was written for children, the author did a good job of keeping things light and engaging. I was especially delighted to see two of my other literary favorites featured in this book. Garth Williams is my all-time favorite illustrator, and William J. Strunk is the best. I’ve personally learned a ton from The Elements of Style so it was great to hear a little more about the men behind it. Just a note that the way in which he met and married his wife is not God-honoring but kept brief and vague. I love Melissa Sweet's writing, but it's the illustrations she makes to accompany her text that wows me. Sweet's technique is unique; she uses a collage of real objects. Her art almost has a 3-D effect. Feb 6, 2019: I'm sure this will be a highlight of my reading year and anticipate it will lead to much reading of E. B. White, or Andy as we learn he was called by friends and family all his life. 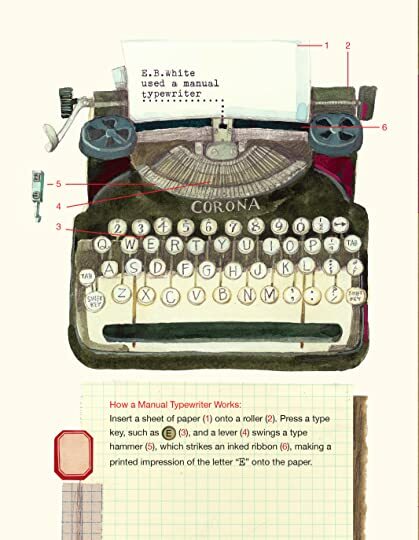 The book itself is a colorful work of art, filled with photographs, collage and quotes/passages recreated on a manual typewriter by Melissa Sweet. I only knew the bare bones of White's life story and am so happy to have learned more about this man who started writing as a boy and never stopped until jus Feb 6, 2019: I'm sure this will be a highlight of my reading year and anticipate it will lead to much reading of E. B. White, or Andy as we learn he was called by friends and family all his life. 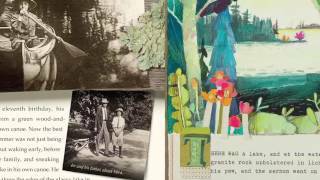 The book itself is a colorful work of art, filled with photographs, collage and quotes/passages recreated on a manual typewriter by Melissa Sweet. I only knew the bare bones of White's life story and am so happy to have learned more about this man who started writing as a boy and never stopped until just days before he took his last breath. Whether you know E. B. White through his three children's books or collections of his essays and letters, and no matter your age, my hunch is you will love this book! And if you are a budding or established writer, all the better. I foresee becoming an evangelist for Some Writer! : The Story of E. B. White. Feb 3, 2019: I'm only about 1/3 of the way through this and deeming it 5 stars! Completely captivated by this illustrated biography of one of my favorite authors. Aimed at children, but this adult is enthralled. This sumptuously illustrated biography for children is catnip for adult lovers of E. B. White. In fact, for ladies with a sapiosexual proclivity (look it up), E. B. White is possibly the sexiest man who ever lived. Thank you to Julie Grippo for reviewing this book and stirring up things all over the place. I was so happily shocked when I came to the realization that I did know this author and have actually read some of their works. There’s something different about reading a biography when you are more involved in the author/celebrity’s life and feel like you share some sort of connection with them. would clearly be able to get the idea of the way E.B. White lived and how he was the kind of writer who wouldn’t obey rules and regulations and just wrote what he wanted to. He wrote what made him happy. He loved life and his family and his barn full of animals. He went on things like unannounced road trips where he would travel the country and do work for free dinners and meals just to experience going with the flow and living in the moment. He saw the value in the little things and this biography showed me that. incredibly creative, it just seemed so fitting that his biography was told with creativity as well. I loved it and this book is beautiful both in word content and art content alike. Where do I begin with Some Writer!? Every facet of Melissa Sweet's new biography is a masterpiece. The writing, the astonishingly unique and creative artwork-I could go on and on. The incredible dust jacket art is going to have some embellishments in the form of 2017 award stickers in a few months. No doubt in my mind. Bravo, Melissa Sweet! I love Melissa Sweet's picture books, and now I know that she writes excellent chapter books as well. I have loved E.B. White's books, but never knew much about the man. I didn't know that he wrote poetry (must look into that) or that he worked for The New Yorker for so many years. I would love to read his 2 collections of Newsbreaks from that magazine. I also never connected him with the the White of Strunk and White's The Elements of Style, which I used in college. He only wrote 3 children's b I love Melissa Sweet's picture books, and now I know that she writes excellent chapter books as well. I have loved E.B. White's books, but never knew much about the man. I didn't know that he wrote poetry (must look into that) or that he worked for The New Yorker for so many years. I would love to read his 2 collections of Newsbreaks from that magazine. I also never connected him with the the White of Strunk and White's The Elements of Style, which I used in college. He only wrote 3 children's books, yet he had such an impact on children's literature. A timeline at the end contains all of his books in the order in which he wrote them. I have to say that this was an oddly readable book despite its length (176 pages) and subject matter (E.B. White just mainly wanted to be left alone and write). Will my students be as blown away by it as the teachers and librarians like me who seem to love it? Probably not. As much as I like The Right Word: Roget and His Thesaurus illustrated by this author, I would not be at all surprised if it has never once circulated. This is delightful*: beautifully presented, with a lot of White's writing included. White's writing is so transcendent that it elevates the entire book - the biographical information is nice and all, but it, the pictures, and the collages feel secondary to the main content: those words. *This sentence included the word "absolutely" before "delightful." It has been cut because I am now more conscious of unnecessary words. I knew that I had to try this biography after my old kindergarten teacher recommended her most recent read. 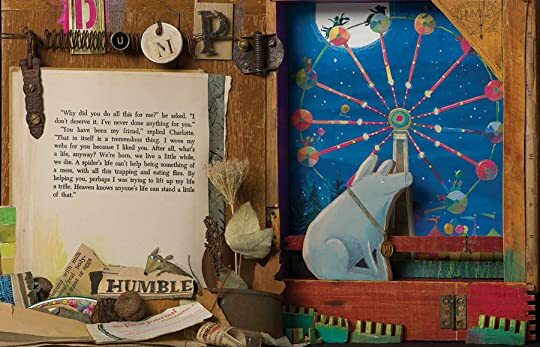 I'm very glad I did because this picture book style memoir of the author of Charlotte's Web and Stuart Little is an absolute must read for fans or anyone intrigued by his fascinating life story. I stumbled upon this book at the library, and I am sure glad I did. What a treasure this book is, and the artwork is beautiful. Now, I think I need to re-read Charlotte's Web. 2) I only have read Charlotte's Web and in general knew nothing about E.B. White before, so after reading Some Writer! I felt that I learned more about him as a person. However, only after reading the timeline at the end of the book did I grasp the full magnitude of his literary and critical contributions to American literature. Therefore, Some Writer! seems to be doing a great job at portraying E.B. White's personal life (although it could be argued that the picture of E.B. White that Melissa Sweet is painting is rather idealistic) but fails to emphasize his achievements. Charlotte's Web was the very first read aloud novel I shared with our oldest daughter, Theadora. While I knew what was coming, I still cried right along with her when it got to that point. We still marveled at the story, breathed it in together, and thus the book became a part of the narrative that weave us together as a family. I was therefore excited to read Some Writer! : The Story of E.B. 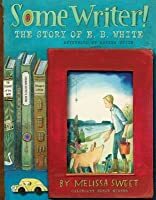 White by Melissa Sweet, because it turns out there is so much I did not know about the famous author who Charlotte's Web was the very first read aloud novel I shared with our oldest daughter, Theadora. While I knew what was coming, I still cried right along with her when it got to that point. We still marveled at the story, breathed it in together, and thus the book became a part of the narrative that weave us together as a family. I was therefore excited to read Some Writer! : The Story of E.B. 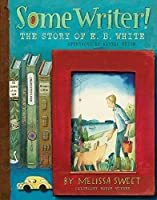 White by Melissa Sweet, because it turns out there is so much I did not know about the famous author who has brought the story of Wilbur and Charlotte into our lives. This book, by far, is one the best biographies I have ever read. The depth of knowledge, the whimsical magic of the illustrations, and the sheer breadth of information is, indeed, wondrous. I kept taking pictures of quotes I wanted to write down, as well as things I wanted to use as teaching materials with my students. I had several students in mind that I want to hand this to as I was reading it as well, thinking of those who love writing, who need inspiration, or who just need an amazing book. Biographies can be hard to read and write, I feel. They often fit a narrow audience because of the way they are written or you are not quite sure that children will stick with them. But this one sets the bar. This is the book I want to use to teach my students how to write non-fiction, this is the book I want to use when I want to teach them how to be better writers, period. I am so grateful to the publisher for sending me a copy of this book, I already ordered another for my classroom, because I think this one will just reside in my house as I try to find my own inspiration to write. What a tale! What a book! What a life! What an absolutely gorgeous book! Were I not about to begin storytime I would spend an hour in a corner weeping about the beauty of telling stories for children! Wonderful biography of E.B White and fantasticly put together. I loved how it was illustrated and the use of quotes to underscore his writing style, approach, and personality. Stuart Little was one of my favourite books and my sister loved Charlotte's Web. Highly recommended. I loved everything about this beautiful book. What a fun way to learn about E.B. White and how several of my most beloved stories came to be. Five stars plus for the adult reader as the layout is lovely and the insight into the author we've loved since childhood is illuminating. Seriously so many good snippets that HE wrote were included. I so appreciate it when words come together beautifully. I wish I had that talent! That said ... I don't see many kids doing much more than flipping through. So two to three for them. Averages to four.